The TH-3065-LPT is a low-profile wall mounting solution for TVs up to 65" screen size or weighing up to 88lb. The slim profile provides a sleek look while quality construction ensures a lifetime of worry-free operation. It is an ideal solution is your display is mounted higher up and requires that additional downward tilt for an optimal viewing angle. TH-3065-LPT provides an infinitely adjustable downward tilt angle of up to 12°. 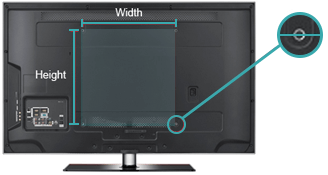 Universal VESA support ensures a high level of display compatibility. The wall plate incorporates slotted holes for easy alignment during set up while the brackets allow for horizontal post installation adjustments. A spring-assisted latching system on the mounting brackets provides a simple and secure method of attachment which also incorporates sash pulls for safe display release. This durable mount is made of 100% recyclable steel and backed up by our 10 year warranty.